• Ajwain seeds - 1/2 tea spoon. Combine butter, chickpea flour, rice flour, turmeric powder, ajwain seeds, salt, cooking soda in a mixing bowl. Mix well (short crust pastry method). Add little by little water and mix to make stiff dough. Divide the dough into two portions and drop one portion of the dough in the press mould. Press the mould and cut the strings to required size. Repeat the same with the other portion of the dough. Preheat the airfryer at 180 degree centigrade for 3-4 minutes. Open the basket and drop the Kara sev strings in air-fry at 180 degree centigrade for 7-8 more minutes. Remove, cool and serve. Kara sev is a popular and easy to make Diwali snack recipe. Kara sev is a popular and easy to make Diwali snack recipe. 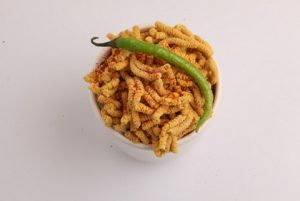 Kara Sev is a ver... Read More..
Kara sev is a popular and easy to make Diwali snack recipe. Kara Sev is a very popular savory snack that can be made in a jiffy. This is one of the well known dishes prepared during the Deepavali festival. Kara Sev with a hot cup of ginger tea is perfect to be had on a windy or rainy day. Kara Sev is made combining chickpea flour, rice flour adding some cooking soda, ajwain seeds (carom seeds), turmeric pd, salt and butter, mixed well together until you get a nice crumbling texture. Little water is added and mixed well to make stiff dough. A ball of dough is put into the mould (Aacha) which has a plate on holes in the bottom side. The mould is pressed and the sev are deep fried until they get golden brown in color. Combine butter, chickpea flour, rice flour, turmeric powder, ajwain seeds, salt, cooking soda in a mixing bowl. Mix well (short crust pastry method). Preheat the airfryer at 180 degree C for 3-4 minutes. Open the basket and drop the Kara sev strings. Air-fry at 180 degree C for 7-8 minutes. But here I will be showing an interesting way of preparing the Kara Sev which is a brilliant method of cooking foods with very little oil and is healthy to eat. By air frying foods, we tend to consume very less oil, they are hassle free, can be kept on the dining table and cooked fresh, and kids can also handle without fear of oil spillage. The Kara Sev on bite is crispy and delights the palate with its delectable savory taste. Kara Sev (Spicy sev) is one of the most loved snacks in India especially north India and can be prepared in many variations such as garlic sev, pepper sev, potato sev, onion sev etc. Chickpea is a very popular gram flour which is commonly known as besan or besan atta and this is obtained from grinding channa dal or chick peas. This is one of the most versatile flour that is used in making a variety of snacks and dishes like pakoras, pancakes, pappads, kadhi (stew) etc. It is also used for preparing various sweet delicacies like mysore pak, burfis etc. Chickpeas offer great nutritional benefits. They are high in fibre and protein, gluten free and have a low glycemic index. Adding chickpea in your diet help lower LDL (bad) cholesterol levels. Besan atta serves as an substitute for eggs in various baked goods. Do prepare this awesome snack and enjoy cooking using air fryer to make healthy and nutritious foods. I bought an air fryer because of your videos!? II'll get one too :) Let wait for black Friday to get g'd deal!! ? i tried this in the air fryer but its tasting raw :( what did i do wrong? WHAT ABOUT THE TASTE ANY COMPROMISE? Saying vanakkam is enoughSasstriyakal looks like troublesome but its your choice? the rate of air fryer. chennaiyil enge kidaikkum. yr rceipes are awesome? Please share chakli video in air fryer... And i wud say ur a wonderful super chef whose videos i watch regularly... Thumps up?